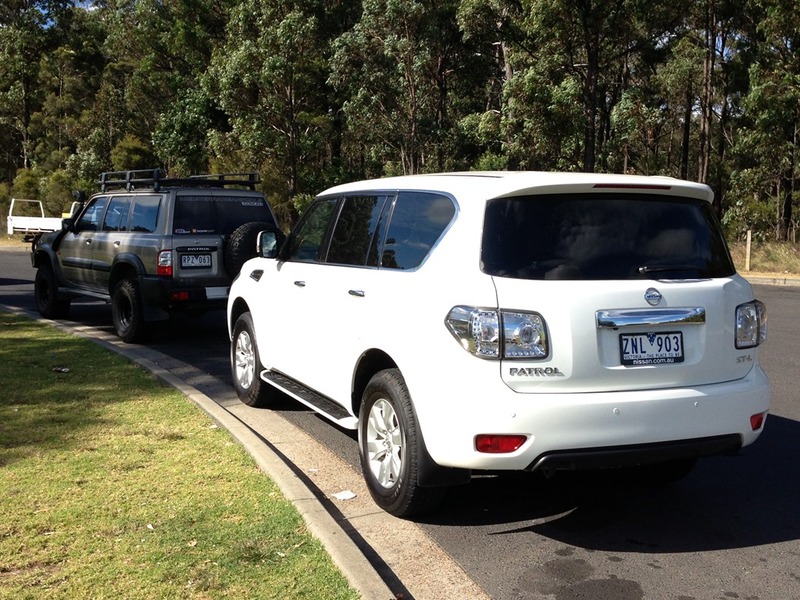 Let’s start with the answer to a question: What’s the difference between an SUV and 4WD? The answer? Nothing. SUV is a term lazy Americans use to describe anything that looks like a raised wagon shaped vehicle driving more than 2 wheels, be they front or back. 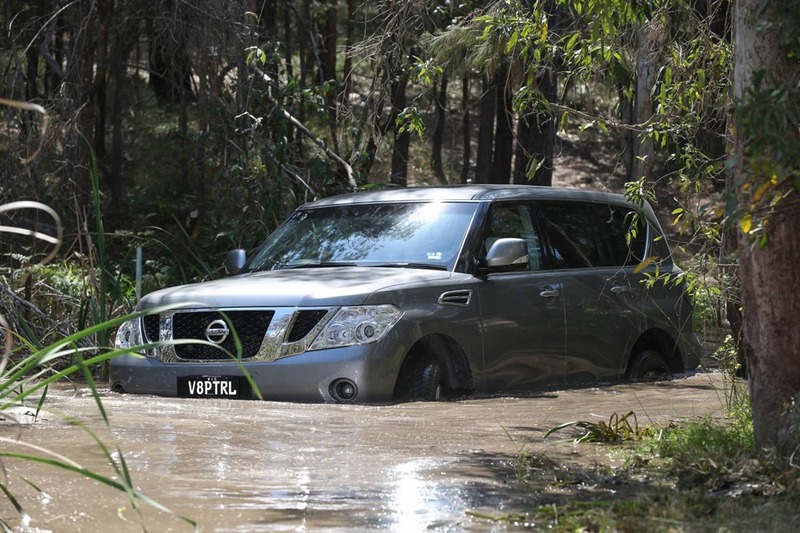 Real 4WD’s have crossed deserts, forded rivers, climbed mountains, and in a recent TV show, reached the North Pole. They have high and low gear ranges effectively doubling the number of gears. 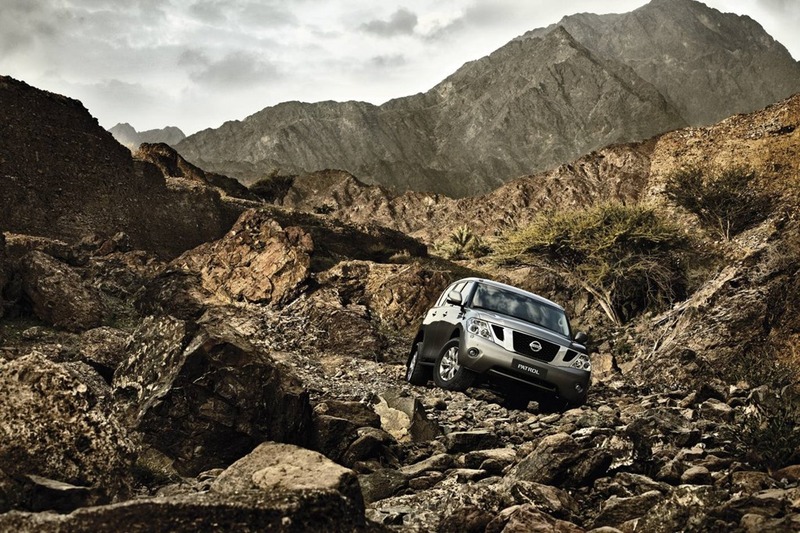 As well, you the option of selecting 2 or 4 wheel drive for the really hard off-road jobs. You can also lock the wheel hubs so that all wheels are turning at the same rate at the same time. With all that extra ground clearance, it means a true 4WD can scamper along the roughest of tracks laughing in the face of her wimpier AWD sisters. At the end of the track all you need is a burley bloke with a machete out front to keep going. Much has changed since the early days when a Willy’s Jeep carried WWII on its back. There is air conditioning and comfy seating and an engine with so much torque that taking off too suddenly has been banned for fear of slowing the Earth’s spin. 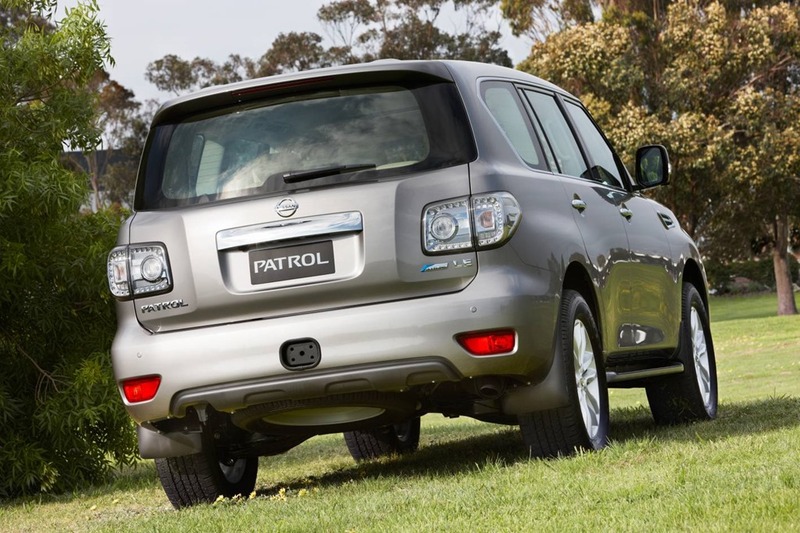 And so, we have Nissan’s shiny new Patrol ST-L. 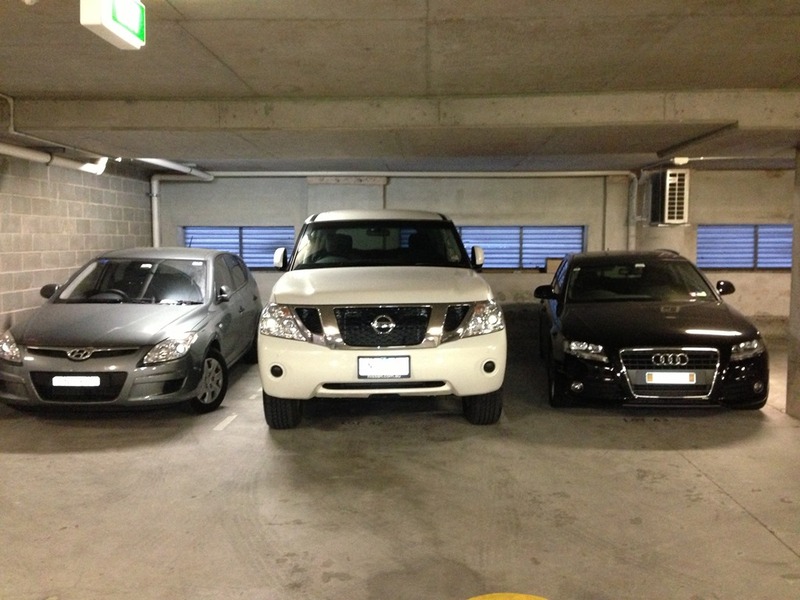 NOTE: parked on the line on one side with about 30cms on the other side to demonstrate the size. Notice how big the Patrol appears compared to the Audi wagon on the right? 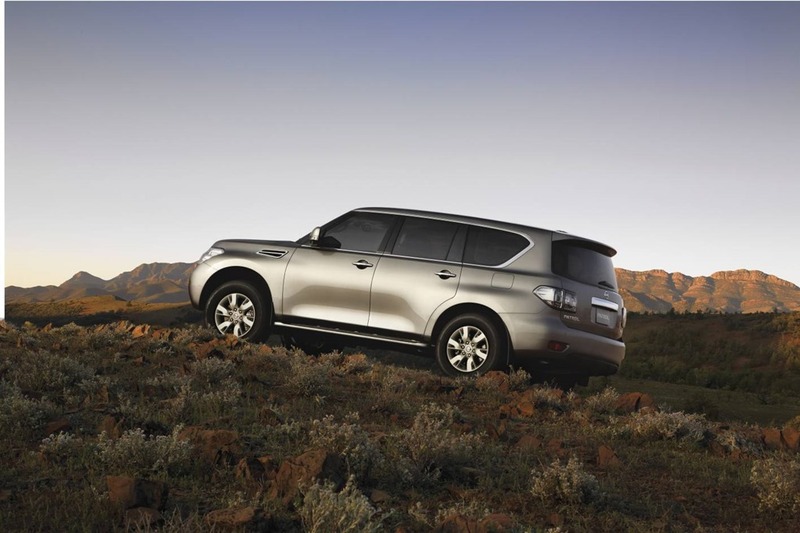 The exterior is rugged and substantial as you would expect of a big butch off-roader. As you get closer you realize just how massive it is. In a normal parking spot there is less than 15cms either side. 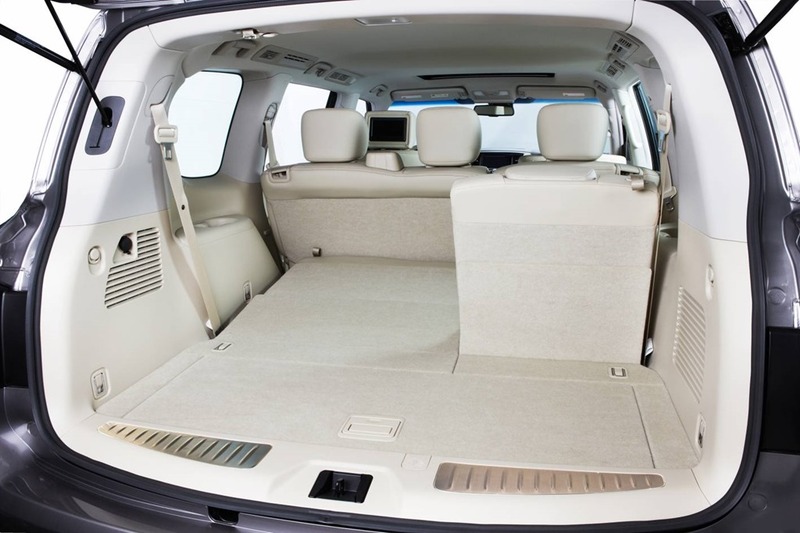 Then there is the aforementioned ground clearance of a smidge over 28cms meaning it towers over everything else on the road. 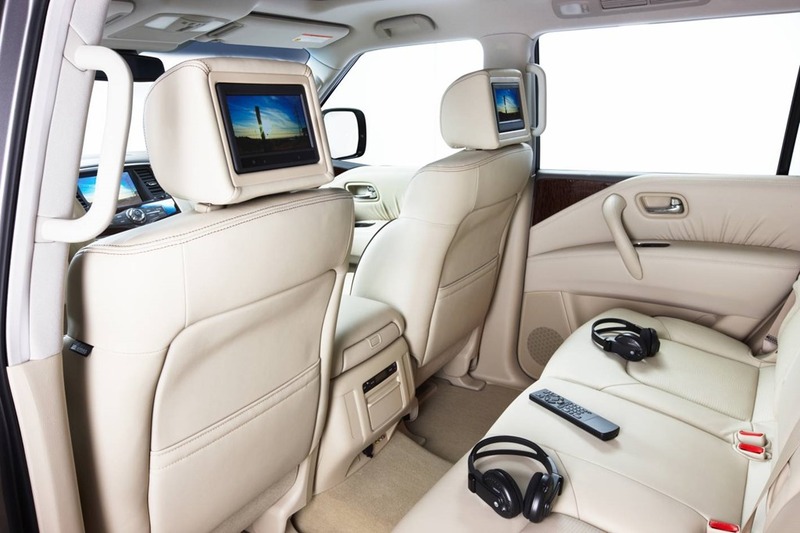 You look straight over the top of BMW’s X5. It’s worth mentioning the attack/departure angles of 34.1°/25.9° means when you approach an unexpected embankment you have all those degrees to play with before you scrape yourself, dirtying your bumpers in the process. You don’t need the key to get in, in fact leave it in your backpack and use the button on the one of the front door handles instead. It senses when you’ve secreted the key about your person and allows the doors to be swung open. This gives you a good view of the cabin because even a tallish man will be seeing most of it at eye height. Our test car had side steps thankfully. Most of us are going to need them in order to climb on-board. Grabbing the jesus-grip on the A pillar means you can easily haul yourself up and in in one easy move. There is a faint whiff of gentlemen’s club about it which I like very much. It engenders a certain sense of entitlement. It makes one feels as though one should don a set of tweeds, a sturdy pair of brogues, and take up a cigar in one hand and a Sloe gin in the other. There are chairs covered in sumptuous fabrics and luxurious leathers resting on thick carpets with wood panelling all round. Everything is on a huge scale. 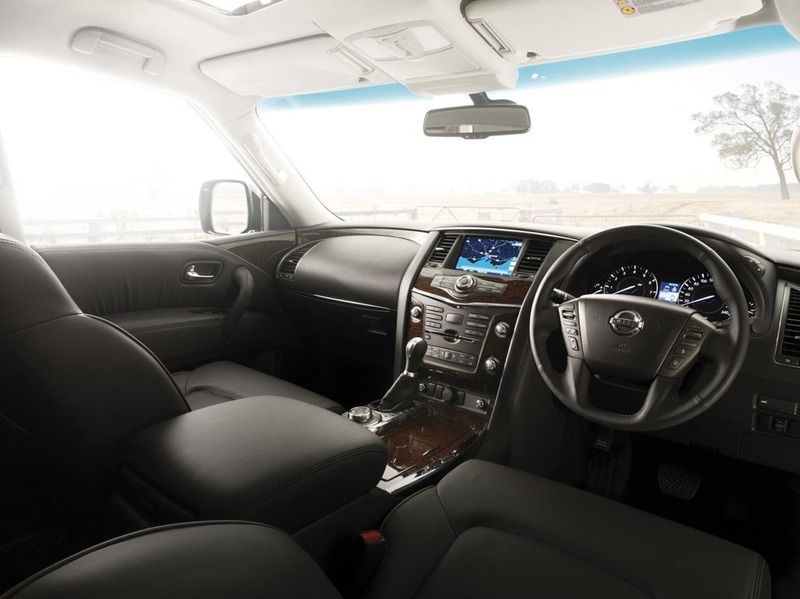 The centre console is as wide as a dining table and the 2nd row of seats are the size of a sofa. 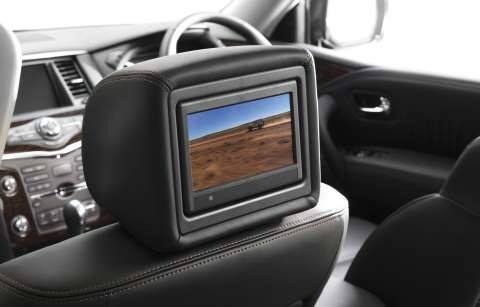 The gear lever and 4WD controls are beside the driver’s hand and the centre stack houses the LCD to display the rear camera and vehicle functions. 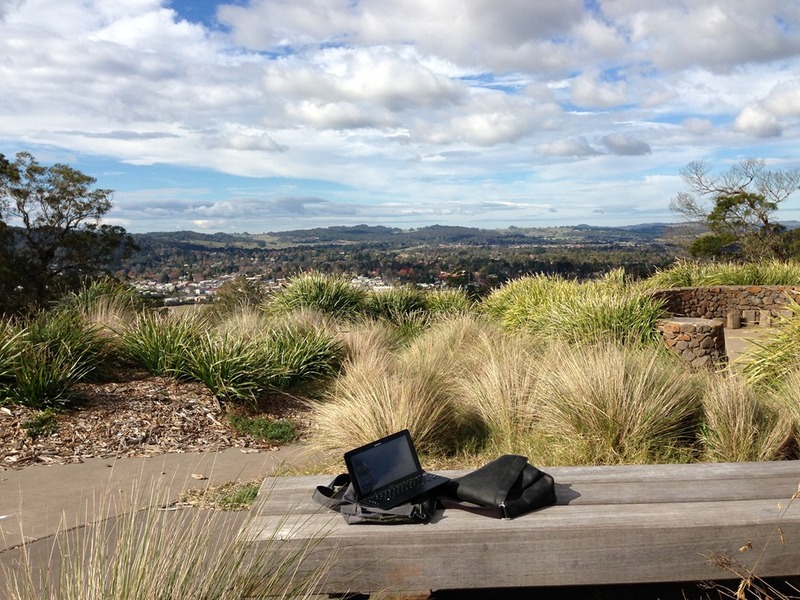 Surprisingly everything is within easy reach without having lean forward. The look and feel of the switch gear is quality with the impression of longevity. It’s a fabulous piece of design. The front electric seats (only on driver’s side in base model) are very comfortable but it’s the second row that are really clever. With the flick of a wrist they collapse and fold forward giving easy access to the 3rd row of seats way back there in cattle-class. It’s fine for short trips, even longer ones if you’re short of stature. There is even enough room behind the 3rd row for a few brace of grouse and your hunting gear. A push of the button wakes the symphony under the bonnet. The 5.6L V8 is magnificent with 298kW of power and 560Nm of torque. The roar is like thunder from the heavens and brings a visceral rumble to your inner core. If you’re not prepared for it, stamping your foot to the floor will bring on a sudden attack of the vapours as you are rocketed to 100KPH in a neck snapping 6.6 seconds. OK that’s not fast if you’ve recently collected a shiny new Bugatti Veyron, but for the rest of us, those are figures a sporty midlife-crisis-hatch can only dream of. It’s the torque that’s really deliciously naughty. From a standing start to a hundred, your private gentlemen’s club is only a few seconds slower than a Ferrari, and has considerably more room. And, let’s see any Ferrari navigate its way through a metre of water without floating away. To be fair, it would probably have burst into flames long before reaching the stream. It would be churlish of me not to mention the sublime auto transmission. Around town it seamlessly moves through the gears to get as high up on the cogs as possible to counter the alarming fuel usage. It’s almost impossible to feel it in operation as it goes quietly about its job. 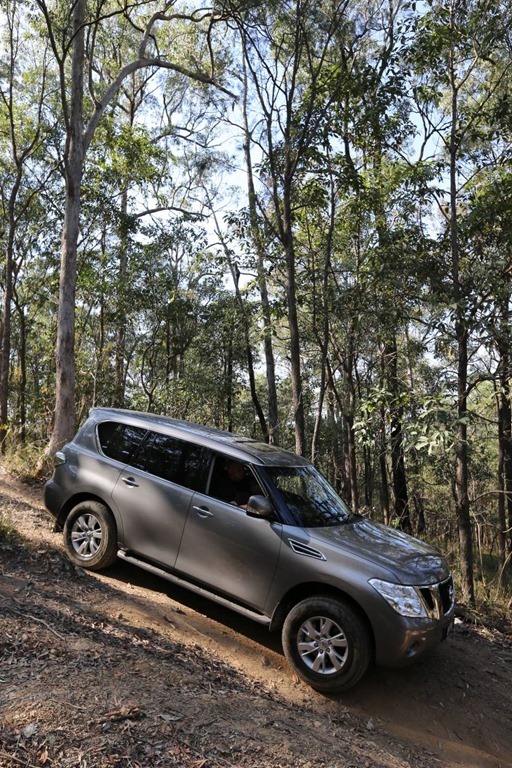 Nissan has done a brilliant job of presenting a genuine alternative to the only other full size 4WD under a hundred grand, Toyota Landcruiser. The Patrol is luxurious, fast and powerful but above all, useable. In order for a car this size to be useful it must be easy to drive in the city which is where is going to see most of its kilometers. 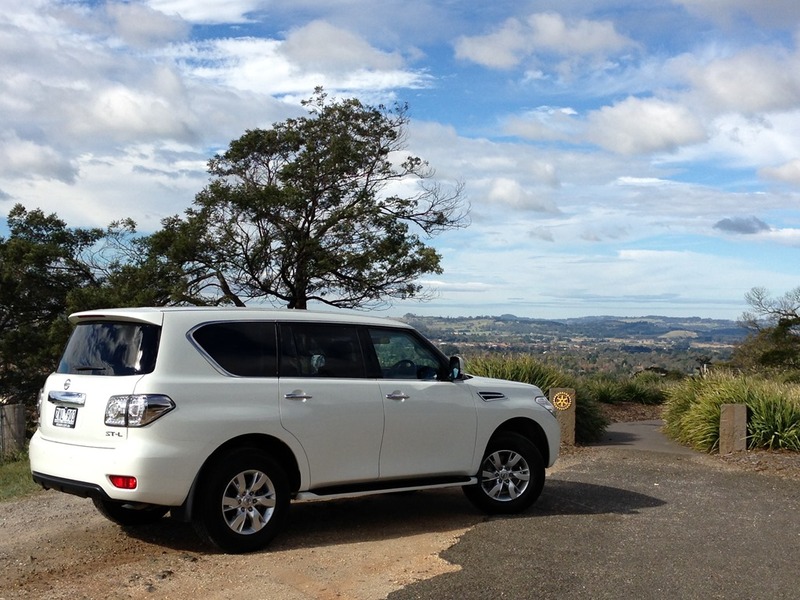 Nissan Australia should be thanked for their perspicacity and perseverance without which we would not have seen this Patrol at our place. 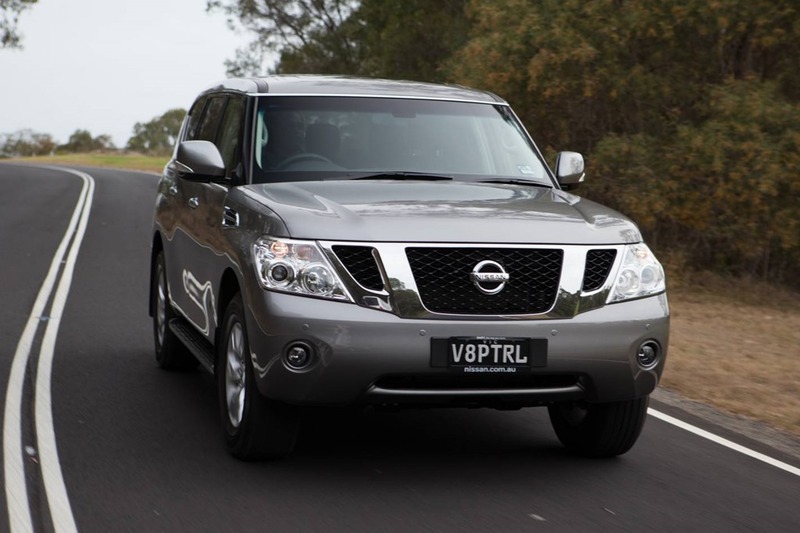 Nissan Australia had to reach deep into its own pockets to fund the right-hand-drive conversion. 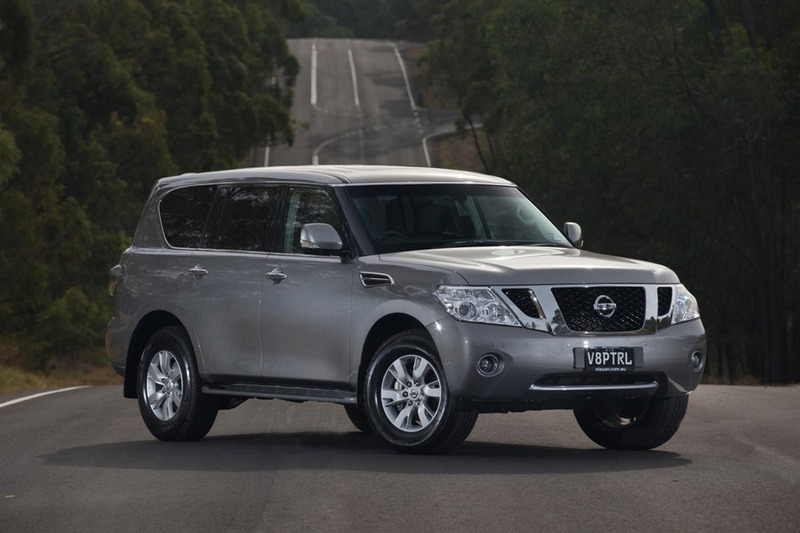 It was built for the American market so not sold in left-hand drive Japan (like Toyota’s FJCruiser). It’s a clever move, though less clever is the lack of a diesel. The previous model Patrol is still available and is being sold alongside the new model for this very reason. Nissan claims 14.5L/100km but our city cycle never bettered 35L/100km. In fact our highway trip of some 300kms returned about 14L/100km. Still, people buying a car like this won’t be terribly worried about the fuel bill. They need not worry overly about running out either because even with 14L/100km you’ll manage a Sydney/Melbourne run with juice to spare on the 140L tank. If you have 4 or 5 people on board that means about $50 a seat which is cheaper than flying and far more comfortable. The city cycle consisted of 6 days beetling about doing chores and running errands. 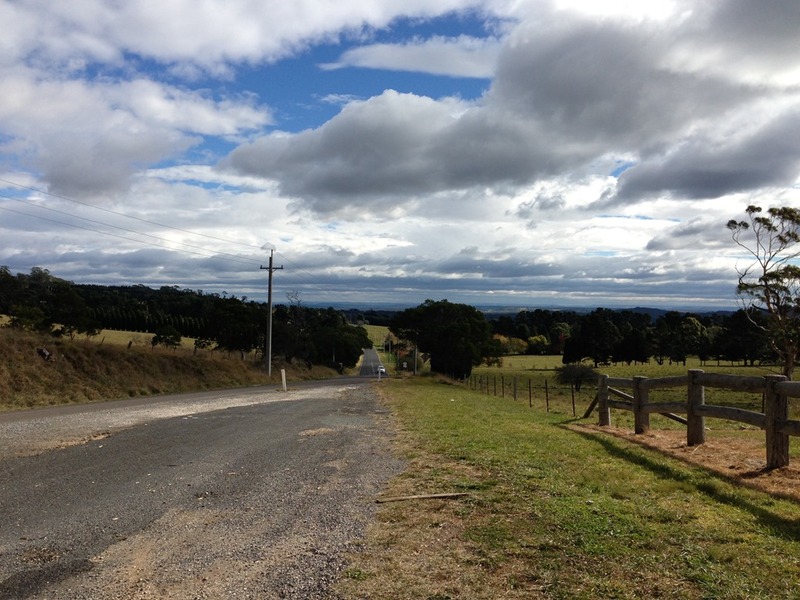 Our highway trip took us to the NSW Southern Highlands which are magnificent in late autumn. As we got further away from Sydney the trees became deeper shades of red and gold. Most of the trip is 110KPH on fairly well maintained highways. The ride, which seemed firm yet supple in town became luxurious and long legged on the open road. It was like riding on a magic carpet, but the only sign of speed was a hint of wind noise. The Patrol at the truckstop. Did you notice the old Patrol parked in front? Pulling in for a coffee break at a truck stop gave me a chance to once again become acquainted with the titanic proportions of the exterior. I say this because during the trip, the inside felt bigger and bigger but the outside felt smaller and smaller. Back on the road, the outside temp was heading south fast. Despite the plummeting temps and the howling winds, the cabin maintained its gentlemen’s club atmosphere. Inside was bliss. It felt insulated but never isolated. You might expect the drive to be truck-like in the city but it’s is as easy as driving a family hatch. OK not quite, because there is considerably more bulk to contend with. Consider this, you’ll find it no harder to park than a Commodore, half the price of a Range Rover, and as powerful as some cars with Italian badges on them. What we have here is an off-roading-muscle-car with room enough to use as a holiday house. It is a stunning piece of engineering and is being hugely under rated. It really is that good and I would happily own one if I was in the market for such a vehicle. 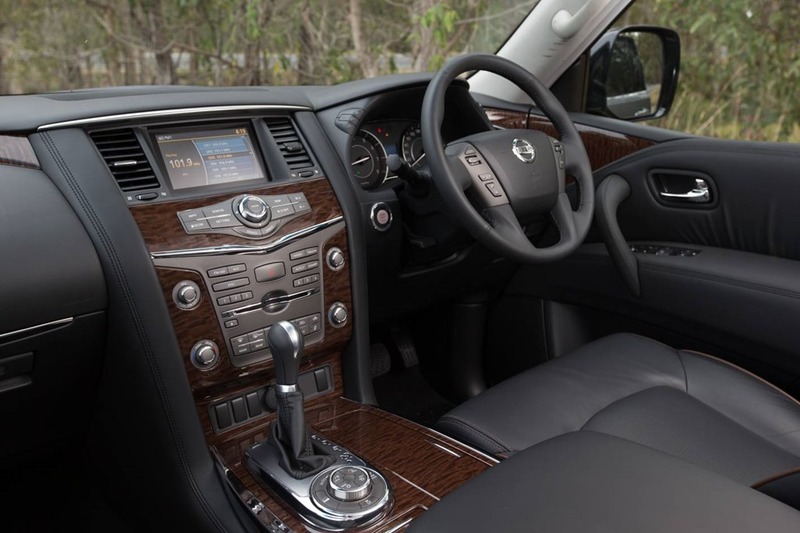 Let me share a story with you, if I may: I have friends with both a Nissan Patrol and a Toyota Landcruiser on their remote central Queensland cattle and sheep property. Like most farmers they simply buy a new car and keep the old ones as hacks. The old Patrol has carried hay, manure, cement and campers in the back. On one occasion recently new lambs were lovingly conveyed to the homestead for intensive care after a troublesome birth. 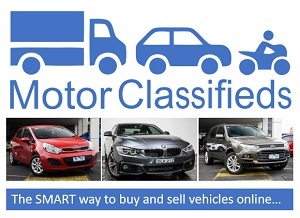 It hasn’t been serviced apart from oil changes on the premises because it is no longer registered. It bumps over paddocks and rocky outcrops, it hauls old stumps out of the ground (because they have used the last of the gelignite moving boulders) and it cannot be killed. If that’s isn’t a confirmation of build quality, design and longevity I don’t know what is. Surely a bit of dawdling around town should be a doddle? YAWN!!! The New BMW X5- Just Like Every X5 That Went Before it. Loved it until I saw the price. Ouch! How do you like the smaller Nissans? My husband drives a Mercury Mariner (same size as the Ford Escape), but we wouldn’t mind having something a tad larger if the gas mileage is decent.